Hello! This is my script for a talk I gave at the Old Jamestown Association meeting Spring 2012. There may be some things of interest in this post if you like history. I hope to update this when I get time to do more research. Please feel free to write to me with questions, or *especially* if you have information on the area/history you wouldn’t mind sharing. calling from Missouri,” you know, not Maine or Michigan or something like that. That seemed to clear the air a little. Missouri resident – and politician. of losses sustained during the Civil War. Jayhawking this or Bushwacking that…..
War than any other states except Virginia and Tennessee. in 1821 as a slave state. Old Jamestown Area. Make no mistake: This is not a scholarly presentation. the Civil War. I enjoy reading about it. Like many others, I am fascinated by it. names and dates has always been tedious and … um… not what I want to know. for the Old Jamestown Area, that I’ll share with you tonight. I’m going to begin with States’ rights. and Obama have in common? And that is not a setup for a bad joke. protection of habeas corpus, or of the right to be charged if you are arrested. in conjunction with Lincoln’s enactment of martial law – or military rule. for suspected terrorists, among other things. Obama recently renewed that law. number of arms at the St. Louis Arsenal. The arms are then removed from St.
Louis to Illinois, with a plan by Jeff Davis to intercept them (which didn’t work). Hmmm. Looks like James Ferguson lives in the “Scuffletown” neighborhood. Maybe that was the former name of Shoveltown? Here’s a good example of families being at complete odds during this war. oath of loyalty to be released from prison. 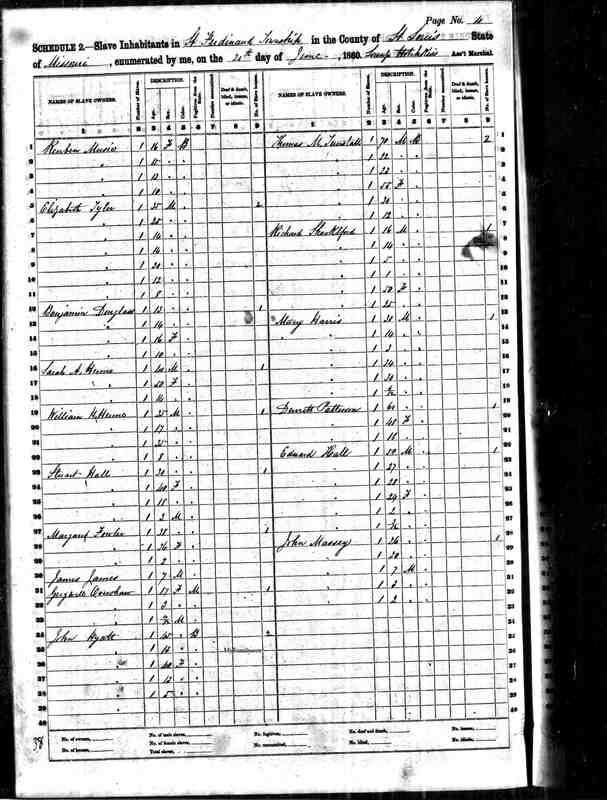 there are three listed on the 1860 slave census records, as we’ll see in a minute. assume bitterly divided. Those are the stories in all of this. 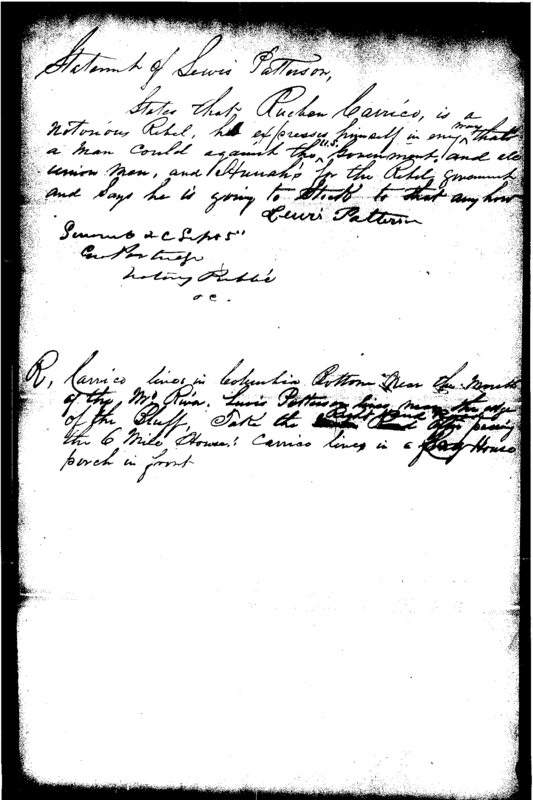 Please let me read Captain Karcher’s report to his superior, Col. Osterhaus, who reports to Major General Fremont. Fremont is in charge of the Army’s Department of the West (West of MS River to California). He’s in charge of a lot here in August 1861.
for St. Louis, where I arrived at 8:00 p.m., August 28th, 1861.
rebels with arms, maybe not. which must be near Chambers and Bellefontaine Road. It’s now a park, I believe. Missouri/Mississippi River islands near us here. definitely check out the Historian/Genealogist link on the page. It’s fantastic. Now on to Slavery in the Old Jamestown Area. 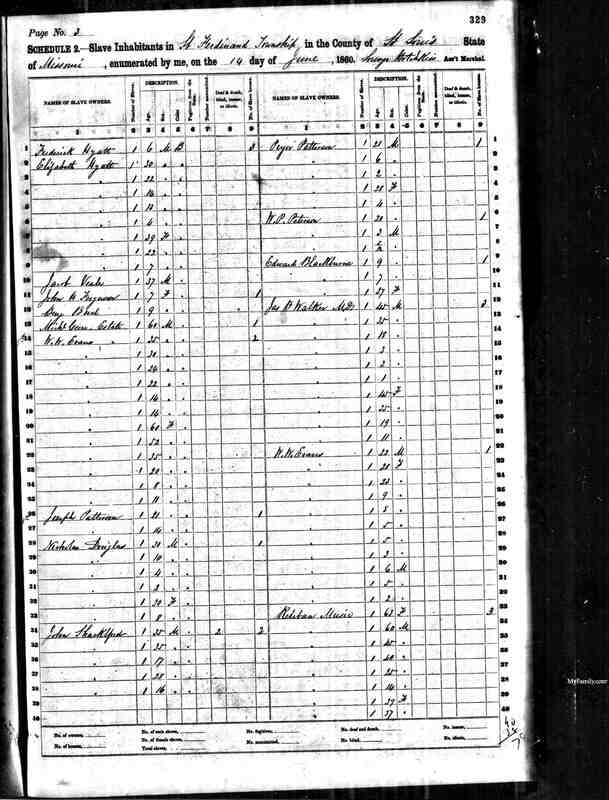 after the 1860 census was done. So please keep that in mind. (freed), and the number of slave houses. of 31 Slave Owners. 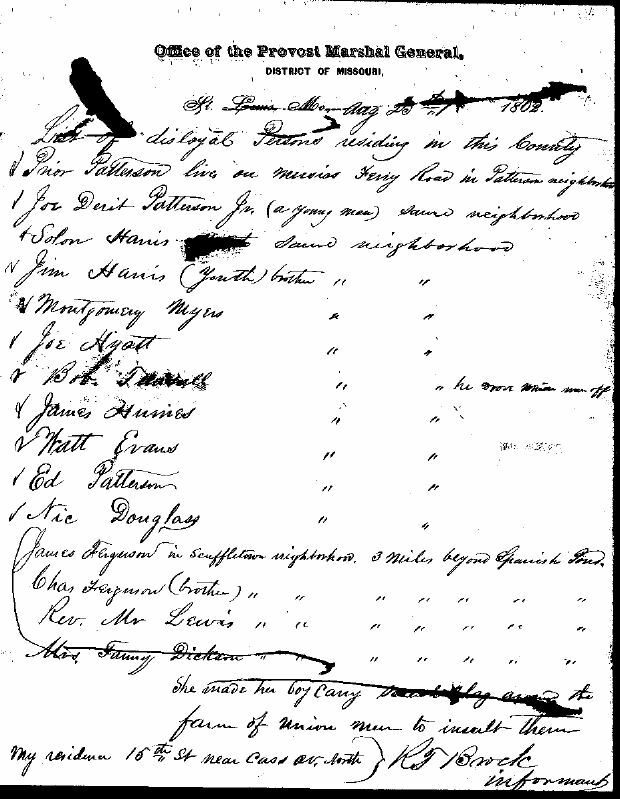 There were 37 listed slave houses. appears on the list, albeit out of the “Old Jamestown Area” range. these be remnants of those slave houses? I wonder…..
slave in 1860), I found Harris Hyatt, 40-year-old Black Male, whose age fits that of one of Elizabeth Hyatt’s slaves per the 1860 Slave Schedules. By the way, do you suppose “Veale,” when spoken by an Englishman, might sound a little like “Vail”? bit of a guess on my part, but it sure looks like Jasper stayed on in the area. and probably had been in the middle Mississippi River valley area since the 1750s. settlement days, including the Old Jamestown area. Proclamation did not free the slaves of states that did not officially secede. which took effect in December 1865. Previous PostUPDATE: HOME RENTED! St. Louis Hills is (are?) Alive with THIS GREAT NEW LISTING @ 6427 Winona!Next PostTeeny Tiny Tornado?